11-12-2015 : Dates extended for issuing original Mark Sheets for SSLC / 10th Supplementary Exam October 2015. Previously, the TNDGE has announced that 11th December as the last date to collect the original marksheets. Now the last date to collect the Marksheets is extended to 18th December . 08-12-2015 : SSLC / 10th Public Exam 2015 Private Candidates can apply from 11th to 24th December . The SSLC / 10th Arrears or Attempt or Private candidates can apply for the Public Exam from the Government Examination Service Centres. The details of the list of Service Centres is given at www.tndge.in website. SSLC / 10th September - October 2015 Exam Retotalling Results / Marks will be published today (25-11-2015) evening 4.00pm at www.tndge.in website. Note : If your register number is not in the result, it should be understood there is no changes in the marks. 28-10-2015 : Tamilnadu SSLC Private Exam September 2015 Result is published by the Tamil Nadu Directorate of Government Examinations (TNDGE). The result has been published in the following TNDGE official website. All the best ! The SSLC re-exam candidates can now download the Provisional Mark Sheet from the TNDGE website by entering your SSLC September 2015 Exam Registration Number and Date of Birth details. 13-08-2015 : Tamilnadu SSLC Private Examination September - October 2015 Notification Published. View full details of the notification. 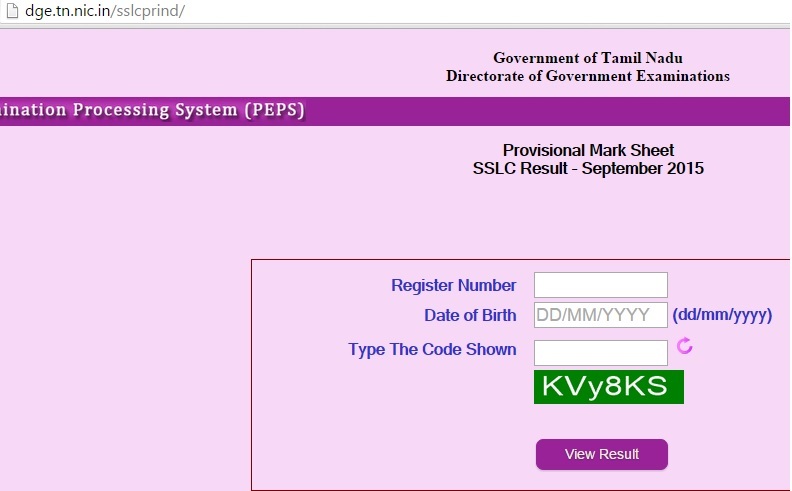 25-10-2014 : Tamilnadu SSLC / 10th Private Exam September / October 2014 Results published today . The Directorate of Government Examination - TNDGE has informed that the results will not be published online. Candidates can know their result by receiving their mark sheets from the Examination Centre where they wrote the Exam. 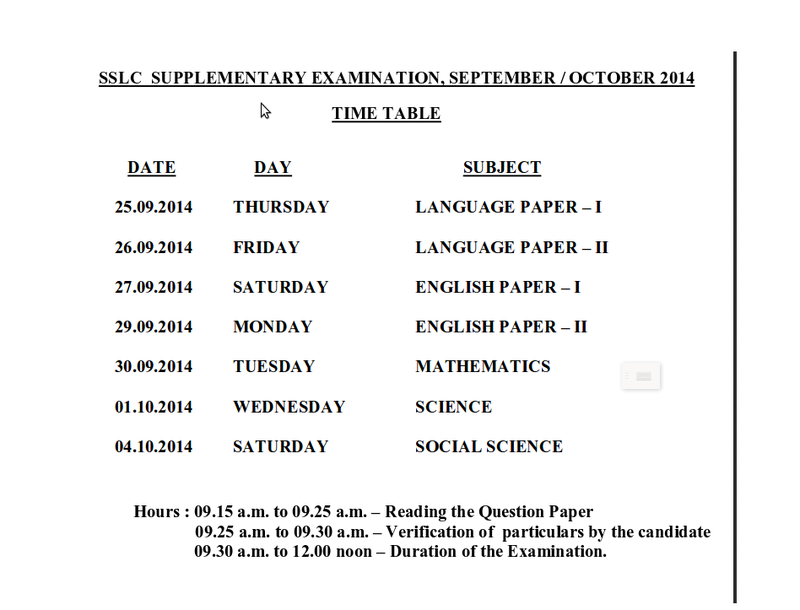 How to apply Retotalling for SSLC / 10th October 2014 Exam ? The candidates applying for retotalling can apply directly at the Directorate of Government Examinations Service Centres from 27-10-2014 to 29-10-2014. They should pay the additional Rs.50 / - as online registration fee with the retotalling fee. 25-08-2014 :Download Hall Ticket for the 10th Supplementary Exam September / October 2014 from tndge website. The Tamilnadu Directorate of Government Examination (TNDGE) has published notification for the Tamilnadu SSLC Supplementary Exam / Private Exam Announcement. Exam Dates : The Exam is scheduled to be conducted from 25-09-2014 to 04-10-2014 . The timing will be morning 9.15 AM to 12 . How to Apply ? : Tamilnadu 10th Private Exam applicants can apply at the Nodal Centres for Online Application located at every Educational Districts.You can find the Educational District wise application centres in the www.tndge.in website.